Nanotechnology has developed tremendously in the past decade and was able to create many new materials with a vast range of potential applications. Carbon nanotubes are an example of these new materials and consist of cylindrical molecules of carbon with diameters of a few nanometers – one nanometer is one millionth of a millimeter. Carbon nanotubes possess exceptional electronic, mechanical and chemical properties, for example they can be used to clean polluted water. Scientists of the University of Vienna had recently published to this new research field in the well-known journal “Environmental Science Technology“. Among many potential applications, carbon nanotubes are great candidate materials for cleaning polluted water. Many water pollutants have very high affinity for carbon nanotubes and pollutants could be removed from contaminated water by filters made of this nanomaterial, for example water soluble drugs which can hardly be separated from water by activated carbon. Problems due to filters’ saturation could be reduced as carbon nanotubes have a very large surface area (e.g. 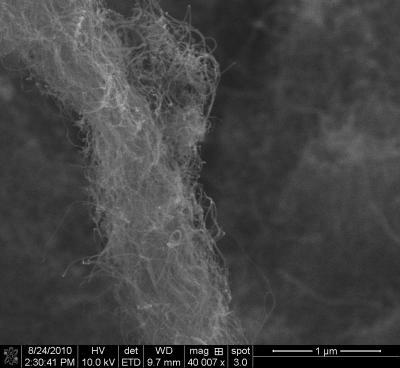 500 m2 per gram of nanotube) and consequently a very high capacity to retain pollutants. “Maintenance and wastes related to water depollution could thus be reduced”, says Thilo Hofmann, Vice Dean of the Faculty of Earth Sciences, Geography and Astronomy of the University of Vienna. A lot of research has focussed on carbon nanotubes in the past decade. However, the exceptional properties of carbon nanotubes make them difficult to study. Standard methods give limited results and the behaviour of carbon nanotubes in realistic conditions is still poorly understood. “Innovative technologies always come with benefits and drawbacks for human and environmental quality and a good understanding of the interactions between contaminants and carbon nanotubes as well as how carbon nanotubes behave in the environment is essential before they can be used in filters”, explains Mélanie Kah, who does research on this project together with Xiaoran Zhang. A team of researchers at the Department of Environmental Geosciences at the University of Vienna is currently carrying out research on the subject. They developed a method called “passive sampling”. Data produced by this new method are much more reliable for realistic applications as they include concentrations likely to occur in the environment (generally very low). This was not possible with classical methods that can only deal with elevated concentrations. The experiments published now in the internationally recognised journal “Environmental Science Technology” took more than a year. First, the “passive sampling method” was developed which allows measuring the affinity of a category of carcinogenic contaminants – i.e. Polycyclic Aromatic Hydrocarbons (PAHs) – to carbon nanotubes. “Series of tests which use analytical chemistry and electron microscopy were performed with collaborators from the University of Utrecht in the Netherlands, to ensure that the method is suitable, reliable and optimised for carbon nanotubes”, illustrates Thilo Hofmann. Once validated, the “passive sampling method” was used to measure the affinity (absorption and adsorption) of several contaminants (PAHs) to carbon nanotubes over a very wide range of concentrations. Another aspect investigated by the scientists of the Department for Environmental Geosciences is the phenomenon of competition between contaminants. Many chemicals often co-exist in the environment, especially in polluted bodies of water. 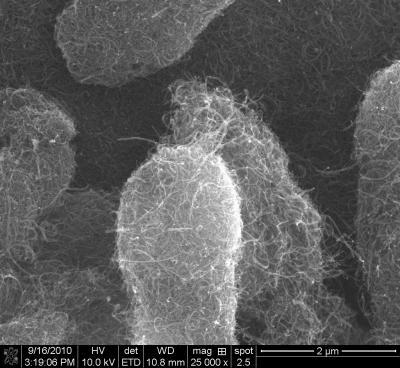 If competition occurs, it means that a contaminant may not attach to carbon nanotubes if better competitors co-exist. Competition is not acceptable for filter application as the efficacy of the filter will vary according to the quantity and type of contaminants present. Studying competition also provides information on the mechanisms of sorption. Using classical techniques with relatively high concentrations showed that competition can be very strong when three PAHs co-exist with carbon nanotubes. Conversely, experiments with the “passive sampling method” at concentrations likely to occur in the environment showed that no competition occurs if 13 PAHs are considered together. This example highlights the importance of developing and using experimental methods to produce results relevant to environmental conditions. There are still many questions to answer to fully evaluate the potential of carbon nanotubes to clean polluted water. “We keep on working on the subject and the results of our last experiments will be soon presented at international conferences”, concludes the environmental geoscientist, Thilo Hofmann.